Maximum size: 23 mm (Kay, 1979). Identification: This species is dark brown or black flecked with white. It has three irregular transverse bands of orange surrounded by diffuse white "halos". Natural history: Spinoaglaja orientalis is a rare species recorded from only one or two animals found at exposed to highly exposed rocky sites. Distribution: Oahu: widely distributed in the Indo-Pacific. 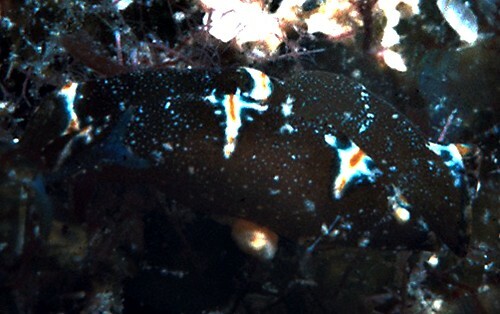 Taxonomic notes: Terry Gosliner suggested that the contracted animal from Kaneohe Bay (see photo) might be sufficiently different to justify listing as a separate species. (pers. com). However, we've opted to lump since Scott's animal seems closer to illustrations from elsewhere in the Indo-Pacific. However, it's possible that all Hawaiian animals will prove distinct from other Indo-Pacific populations of S. orientalis with further work. It's listed in Gosliner, et. al, 2008 as Aglaja sp. #1 and in Gosliner, et. al., 2018 as Philinopsis orientalis. It was probably first recorded in Hawaii from Kaneohe Bay, Oahu by Terry Gosliner in the 1970s and is listed in Gosliner, 1980 as Aglaja orientalis. Photo: Scott Johnson: Makua, Oahu; July 10, 1985.